The Fear Collective - The Awakening Collective - The Christ Consciousness Collective and the Changes. Yesterday morning as I sat down to write, for the first time ever, my team asked me to hold, wait a day to share. Of course, I complied, but as I pondered why, I could see this intense release of what looked like snow falling down everywhere outside (spiritually speaking, not literally.) Thank god this pause did not affect the readings, but the readings did help me understand what I seen in the morning. I'll get to all that in a moment. This morning, my whole energy field is so conflicted. The tremendous amount of energy thru the readings yesterday... OMG there was a party in my body all day long. I woke up and the third thing i did (hey, potty and coffee always comes before anything) was check the poll results from yesterday. Now I am a little sad, if not just stunned at the mass majority of choices. Yes voter fraud has played into the results big time, the major news networks declaring Hillary the presumptive winner before anyone cast their first vote yesterday morning, played heavily into voter suppression as well, and I want to go into bitchy, whiny mode. And I instantly hear my team say, but it has to be this way. We are being shown a huge (multi) collective mirror thru this particular election season. A reflection straight back to us and our own position in the multi-collective energies. About a week ago, thru the readings of course, our teams went back to my old school way of seeing the "collectives." There are major groups of collectives and many divisions within those groups. But lets pull the major groups as my team labeled them to reflect our primary candidates. Keeping in mind, there is no judgement at all. We are a species in a varying degree of evolution or even devolution and all is perfect. The densest of collectives is the Fear Collective. Where the ego stands alone, divided by self-identity. It judges anything and everything not like itself. This would be a perfect reflection of the Trump Camp. Then we have the Awakening Collective. Where the old strategies of life are so familiar they are hard to let go of. Yet, the ability to see and know a better way is there. Anyone who has genuinely gone thru the ascension process knows just how difficult this place is. All the familiars are part of ones personal identity and even if none of those identifiers have worked to their personal joy enhancement and life expansive benefit, it's still better than not knowing what is on the other side of letting it go. This would reflect the Hillary Camp. Then there is the Christ Consciousness Collective. Where we know we are all a part of each other. That to help one is to help the All. To change ourselves is to change the world (and can never work the other way around.) Where we leap into the blind spots with knowing a great outcome is at hand, even if we are shaking in our boots as we leap. Change is the only productive and constant in life. To share of our wisdom and our passion outwards in love and firmness. This would reflect the Bernie Camp. It's easy to be in the first two collectives and be outspoken, displaying themselves outwards. This third collective tho, the Christ Consciousness... not so much. We tend to look for others of like minds and share only to the places that appear safe harbor, with each other. That has served us well, until now. If we look back at the tiny fragments of memories we have of the life and death of Jesus, when he was fully "out" in the open sharing his knowings, he was crucified... and he did it anywayz. Lets hold this thought for a moment and turn to the energies released and understood thru the readings yesterday. What I have not mentioned to date thru the readings this month is the constant, because I really didn't fully understand the significance. The last two days, it became clearer in my understanding. Everyone was in relationship (either inside or outside) of this super large bubble thing. The bubble was easy 30 feet in circumference and altho completely clear/see thru, emanated this golden energy from its surface. Spirit finally started to explain that the closet idea we can understand in what this bubble is would be our version of an amniotic sac. They gave me a visual of when an animal is born and they still have the amniotic sac around them, similar scenario with what we are seeing in readings, but equally, very different too. My first lady yesterday, visually speaking, totally shocked me. She was inside this bubble way at the furthest edge of it near my back door, east field area. Around her there were golden bars (think jail bars) and she was facing me. It really seemed so out of place for what I was understanding about this sac/bubble thing. But we do have free will even in the holiest of places. The bars are self-imposed. There is a man in her life insisting he is her "twin flame" and for years has been giving many false promises (never kept them.) And yet, she wants to believe he is that to her. Her team, straight out said... ummm no. But as free will goes, we have the choice to stay imprisoned with our focus on what no longer can serve us, or turn around, close all incoming energies and head towards being in our center again. The universe is unbiased and honors our free will choices all-ways. It's kinda funny to hear spirit explain why something is not beneficial to us and we respond in all the justifications why it is. We can be so human and I love us so much!! Moral of this story, even if you raised your vibration to the realm of being a part of the living body of god, we take a back seat of participation within it (hence the bars) until we release all we think we know and desire. Very much like a system reboot. My second lady, wow was there a downpour of all kinds of energy happening directly over her "bubble." It was raining, hailing, sleating and snowing all at once, intensely. To the degree it created like cracks in this bubble thing (think, breaking an egg shell.) I understood the incoming variation of energy was symbolic to the vast emotional field coming thru. Not a negative in any way, but the many forms of love itself. The pure, unconditional kind of love. Then I watched as these crazy things started to emerge out of the cracks of the bubble... veins!! The circulatory system within the living body of god. What shocked me, even more than my first lady, was what came next. These veins (very blood red in my visual) elongated and sprouted like tiny roots at the end and suddenly connected themselves upwards to something that resembled a spider web. Her team explained it was to the other consciousnesses, but not just on earth, in all the realms that have evolved to the degree to be the living body of god. In my own ignorance, I really really thought this whole body of god thing was ONLY an earth (us) thing. Ohhh not only no, but freakin hell no. ALL (to use our human term) enlightened Beings are a part of this living body of god. 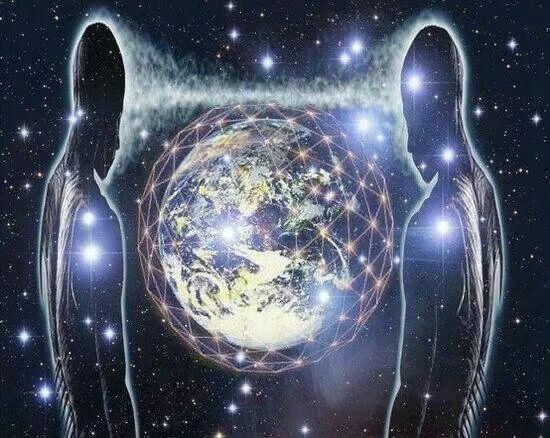 No wonder we are knee-deep in ET connections this month, it is as vital a connection as we are to them. Also, her team explained that this energy raining down is equally distributing inside and outside that bubble thing. "The sustenance of all you will ever need for all you will ever desire is there, unlimitedly." Then my third lady, holy wowzers batman. I started seeing her before our time together and it was different too. Her bubble thing went from a luminous gold to this beautiful black (like the night sky) with all different streams of colors moving thru it. I could hear tones... very melodic tones. When we got connected, it was so easy and fluid. She is the "ears" of god. Unlike us humans who have an ear on either side of our head, God hears with his (again, my personal choice of words) whole Being. Unlike us, he does not hear "words" he hears emotions. This is one reason why words don't matter at all, its the emotion in which you speak any of it that does. In so many readings, I can honestly say, I hear someone say one thing but their energy is saying something completely different. The pineal glad is the central translation of this energy, this communication. When you and I hear the communication of spirit, of our friends from the stars, we are using the built in translator of information to a language we understand (for me, that would be english.) This translation is crucial to fully connect consciously with the ALL, god, other Beings and each other. This is one key reason that the foundation we call meditation opens up first in the feeling arena. If we never get beyond understanding the full spectrum of communication within the feeling world, all else is secondary and looses meaning and relevance. So even with this understanding this morning, every part of the Body of the energy system my team is now calling the living body of god hears. There are some, like my lady whose role is to hear as much as she can and interpret it into the language she speaks (english) and share it outwards with the world. Her team expressed youtube as her method, visibility and audibility too. There is a storm already underway, the most loving storm the earth will ever know. Altho, it may not appear that way at all. The earth will rise up, the rains shall fall down and change towards the unified field will be what is at hand. And WE will be shoved out of the shadows into full action!! Thank you so much for sharing your love with my beautiful baby girl!! There is a tie in with the collectives and the living body of god, but we are going to let you understand that more deeply. You are so loved, cherished and and unyieldingly supported AS the Grace of God, of Life itself. Imprints from the Akashic Records. There is More to the Vast Terrains and Weather On Earth!